The Best Herbal Podcasts from thousands of Herbal Podcasts on the web using search and social metrics. Subscribe to these audio podcasts because they are actively working to educate, inspire, and empower their readers with frequent updates and high-quality episodes. Herbal Podcast newsletter is a comprehensive summary of the day's most important audio podcasts episodes from the best podcasters on the web, and delivered to your email inbox each morning. To subscribe, simply provide us with your email address. Berkeley, CA About Podcast The Herbal Highway enhances the community's knowledge of herbal medicine and alternative choices to standard medical practices for healing. In order to have balanced life, The Herbal Highway actively supports and promotes Indigenous land rights, protection of sacred sites and the sustainability of the Earth as integral parts of individual, community and global healing. Hosted and produced by Karyn Sanders and Sarah Holmes. Facebook fans 16,983. Twitter followers 11,407. About Podcast Let's take a deep dive into all things herbal with some of the best teachers in the field of plant medicine, wild foods, botany and health accessibility. You'll hear class recordings from conferences, narrated plant monographs, books, and blog posts, interviews, event updates and so much more. Facebook fans 443. Twitter followers 96. Massachusetts About Podcast Holistic Herbalism goes beyond "quick fixes" and transforms our entire approach to healing. We've found that there are four primary factors to consider when making choices about herbs and healing protocols. Our free mini-course guides you through the pillars of Holistic Herbalism, an integrated approach that gives you a foundation for successful practice for. Facebook fans 3,673. Twitter followers 706. Eugene, Oregon About Podcast Real Herbalism Radio is a podcast hosted by Candace Hunter and Sue Sierralupé. Their goal with the podcast is to provide sound information on herbal, homesteading, and natural living topics. They blend scientific with traditional approaches and seek to feature a variety of guests and herbalists on the show. Their podcasts includes topics like mushrooms and medicine, herbs from different regions, specific plants or plant families, gardening and permaculture, animal husbandry. Facebook fans 8,735. Twitter followers 2,946. Los Angeles, CA About Podcast We offer a full selection of traditional Chinese herbs, tonics, teas, and training to help you benefit in every possible way from the healing power of plant medicine. To know more on this, subscribe with us. Facebook fans 5,002. Twitter followers 4,443. About Podcast Medicine Stories is a podcast hosted by herbalist Amber Magnolia Hill. Her goal with the podcast is to encourage people to pay attention to what stirs their soul through nature, ancestry, dreams, consciousness-expanding experiences and substances, trauma and loss, and healing in all its many forms. She interviews herbalists, story keepers, ancestral listeners, consciousness explorers, earth dreamers, and other wise folk in an effort to explore the mythic journeys. Facebook fans 3,829. Twitter followers 456. About Podcast We're thrilled to share our very own podcast: Herbal Radio! This community resource is a collection of curated lectures from some of our generation's most esteemed herbalists. Facebook fans 483,665. Twitter followers 30,079. About Podcast Sustainable World Radio brings you podcasts about ecology, ethnobotany, herbal medicine, Permaculture, organic gardening, sustainability, natural building, and regenerative farming. Since 2004, Sustainable World has interviewed experts from around the globe; teachers, designers, environmentalists and earth activists who learn from and work with Nature. Facebook fans 2,181. Twitter followers 929. About Podcast Discover the wisdom that herbal medicine has to offer. Join Kris Vaughan, Certified Clinical Herbalist, for discussions on the use of medicinal herbs, herbal medicine making, and more. About Podcast A weekly podcast that will feature a new herbal medicine to talk about and share personal opinions on. For more updates on these, subscribe with us. 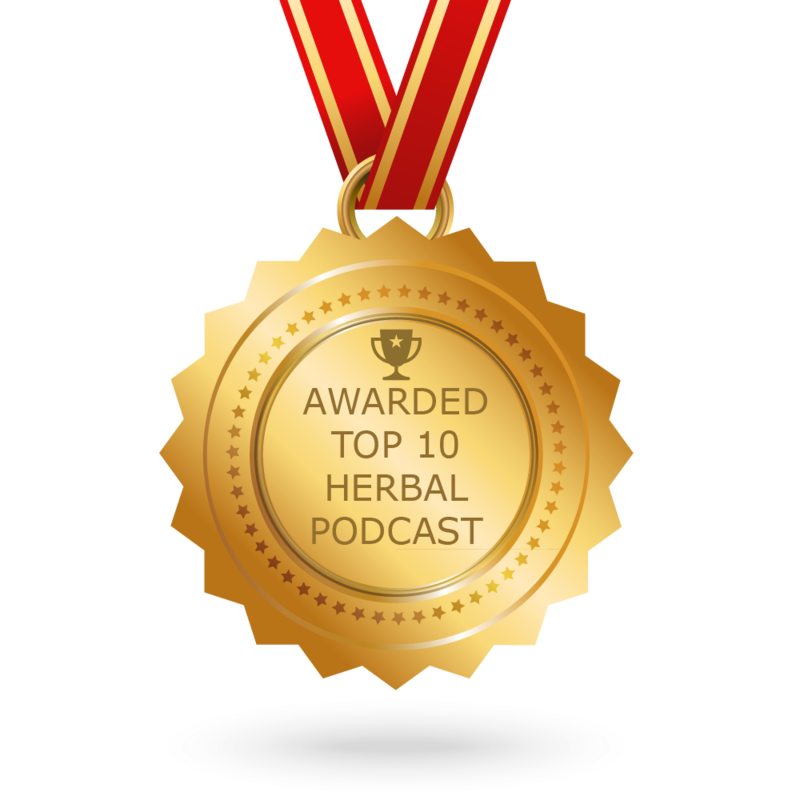 CONGRATULATIONS to every podcaster that has made this Top Herbal Podcasts list! This is the most comprehensive list of best Herbal Podcasts on the internet and I’m honoured to have you as part of this! I personally give you a high-five and want to thank you for your contribution to this world.